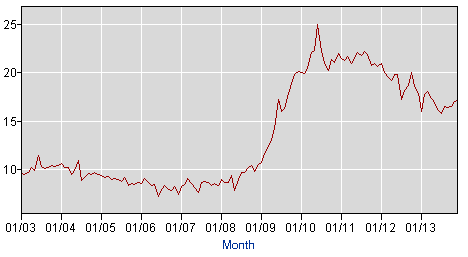 The median duration of unemployment ticked up to 17.1 weeks last month, according to the Bureau of Labor Statistics. That means that last month, more than half of all 10.3 million Americans officially considered unemployed had been out of work for more than 17.1 weeks, and half for less. The December jobs report landed in the midst of an ongoing debate in Congress about whether, and how, to extend federal benefits for the long-term unemployed. In most states benefits run out after 26 weeks, but during periods of high unemployment Congress typically extends them. However, the most recent extension ran out at the end of 2013, cutting off payments to an estimated 1.3 million jobless people. The Senate is expected to vote Tuesday on whether to end debate on a bipartisan proposal to further extend benefits for the long-term unemployed. Median duration of unemployment, in weeks. Discussion of long-term unemployment often centers on average, rather than median, duration of unemployment. (The average duration in December, adjusted for seasonal variations, was 37.1 weeks.) But, as Fact Tank explained last year, the average skews higher because it includes hundreds of thousands of people who’ve been out of work for years.